Defending the line: 108th Airmen defend the flightline during a simulated enemy attack. Photo courtesy 108ARW/PA. After countless weeks of meetings, planning sessions, and Load Exercises/Operational Readiness Exercises, the results came back during the Aug. 10 IG out-brief in the form of strong accolades from Col. Stan Dougherty, the Inspector General Team Chief, and his Air Mobility Command IG team. During the briefing, more than 350 personnel applauded and cheered, as statements of “best seen to date” and “never seen before” peppered the narrators’ speech. The 108th Air Refueling Wing received an Excellent rating for its execution of Operational Plan 8044; Satisfactory rating for the Operational Readiness Inspection; and Satisfactory for the four Special Interest Items by the IG team during the ORI held July 20-29. Many sections on the IG’s list received high ratings, such as Aircrew Generation, and Command and Control, who received Excellent ratings, as well as CP Controller Testing, Aircrew Testing and Intelligence, all of which received Outstanding ratings. “Admirable wing leadership directed an effective unit generation, demonstrating a thorough understanding of the wing’s OPLAN 8044 mission taskings and procedures,” observed Dougherty. 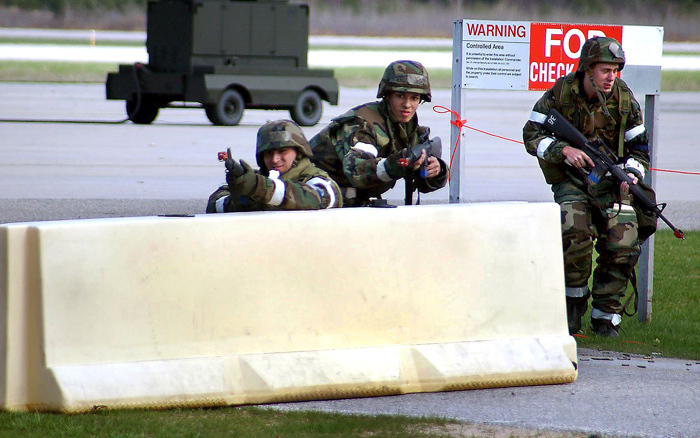 Under a simulated wartime environment staged at Alpena Combat Readiness Training Center in Alpena, Mich., the 108th ARW was tested in every aspect imaginable for the ORI, which occurs once every five years. The IG team, made up of more than twenty Airmen from Scott AFB, Ill., played the role of inspector and simulated enemy during the week-long exercise. Many unit members were individually recognized for their efforts during the ORI. Senior Master Sgt. Michele L. Evans and Master Sgt. Richard S. Kilgore, 108th Maintenance Squadron; Master Sgt. Jennifer D. Noble-Slaton, 108th Communications Flight; Tech. Sgt. Gerald Leone, 141st Air Refueling Squadron; Tech. Sgt. Luis R. Callazo- Morales, 227th Special Operations Flight; Staff Sgt. Israel Carabello, 108th Operations Support Flight; Staff Sgt. Jamero A. Clark, 108th Logistics Readiness Squadron; Staff Sgt. Lauren M. Paul, 108th Services Flight; Senior Airman Carol E. Guzman, 108th Aircraft Maintenance Squadron and Senior Airman Jeanie M. Hubbard with the 108th Logistics Readiness Squadron all received coins from the IG team. Capt. Christopher L. Miller, a 108th ARW chaplain, was individually recognized by the IG team. The IG team also recognized the Aircrew Life Support, Aircraft Maintenance, Intelligence Flight, Main Flightline Entry Controller, and North Flightline Entry Controller teams. “The men and women of the 108th ARW are well trained, highly motivated, and fully equipped,” observed Dougherty. “Everyone’s hard work, motivation, sense of urgency, and positive attitudes upheld its claim to being America’s Best Refueling Wing. Throughout the past five years, the 108th ARW has proven itself time and time again to be an excellent and outstanding wing,” said Col. Michael L. Cunniff, Commander, 108th ARW.